According to the Centers for Disease Control (CDC) approximately one in 25 acute care patients acquires an infection during their stay. These findings are alarming and have triggered an urgency to address the issues surrounding patient acquired infections. Facilities managers and infection control practitioners (ICPs) are aware of how bacteria and mold grow in/on horizontal and vertical surfaces. It wasn’t until recently that sinks, countertops and wall cladding were studied as potential sites for the spread of disease. Plastic laminate finishes on healthcare casework and wall cladding have seams and exposed edges that can harbor bacteria. Laminate substrate is usually particle board. While it is dense and may appear to be non-absorbent, it is porous and will absorb moisture over time. Wet wood will harbor bacteria, especially Aspergillus fungi. A solution to these problems can be found by utilizing solid surface which inherently inhibits bacterial growth. By creating a seamless, nonporous surface where pathogens can’t grow, solid surface can help with control issues and maintenance. Solid surfaces such as Corian, Avonite, Wilsonart, Durasein, LG or Krion can survive the impacts, nicks and cuts that ruin most wall surfaces. It is renewable, repairable and reusable. If the solid surface is damaged it can be repaired onsite, saving labor costs and resources. While warranties may vary from manufacturers, some will guarantee the material for as long a ten years. Public seating in high traffic applications can take quite a beating. Design professionals are under increasing pressure from clients to provide seating solutions that are both durable and comfortable. Many are unaware of the flexibility solid surface provides to create seating that conforms ergonomically. The inherent performance characteristics of thermoformed solid surface materials provide an amazing opportunity to increase the longevity of public seating. Design professionals today are bombarded with a plethora of furniture seating solutions. Unfortunately, many of these “seating systems” are poorly manufactured with planned obsolescence. Constructed of cheaper plastics, many of these systems fail soon after warranty expiration. This is hardly a strategy for clients looking to be environmentally responsible. Design professionals need to provide smart ergonomic seating solutions addressing both performance and value. These challenges seem insurmountable when industry standard public seating systems don’t fulfill your specified requirements. ASST has the capability to help. With a state-of-the-art thermoforming studio we can create ergonomic seating to your exact design specifications. We can share past solid surface project case studies to inspire your creativity. Working in concert with your team, we provide design assistance and credible information to present to your clients. Tailored services to meet busy design professional’s needs are what we do! Let us assist you with your next solid surface seating project! Whatever you need, ASST can build it to the exact specifications, in a safe manner and to the finest quality standards you expect. We look forward to Going Beyond for your exciting project! Contact us now online or call us at 717-630-1251. Can inspiration be engineered? Can the urge to do something creative be designed? 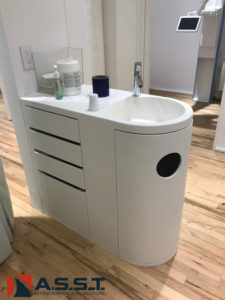 What if we told you that solid surfaces could be formed into ANY shape and that flat tops are yesterday’s solid surface? Most people don’t realize that you can get the everlasting qualities of solid surfaces in whichever design you want. Solid surfaces are known for minimizing the spread of bacteria and durability. Solid surfaces are not known for the ability to be formed into different shapes. Architects want to illicit emotions with their designs. Owners want to wow customers with a product that is long lasting and cost effective. General Contractors want a design that is uncomplicated and safe to build. How do we provide the desired outcome to all parties involved? Because of ASST’s depth of experience we can provide a wealth of knowledge for your solid surface project. We can share creative ideas and best practices incorporating solid surfaces into your next project. Whether you are looking for curved solid surfaces, translucent backlit vertical panels or unique public seating, ASST can help. 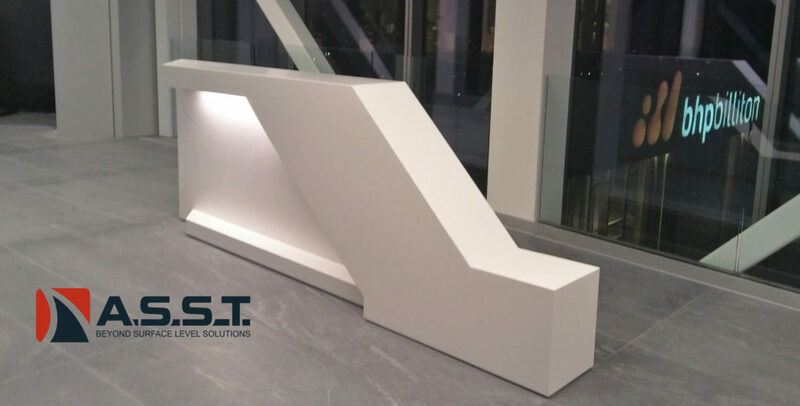 We can provide you with the project inspiration and technical details to make your solid surface strategy a success! ASST is uniquely positioned to fulfill all aspects of your project. Whatever you need, ASST can build it to the exact specifications, in a safe manner and to the finest quality standards you expect. We look forward to Going Beyond for your exciting project! Contact us now online or call us at 717-630-1251. The healthcare industry has long understood the necessity of reducing the spread of bacteria by minimizing the use of porous materials. For years the healthcare industry has utilized Plastic Laminate (PLAM) casework because of the cost effective traits. Solid surfaces such as Corian ®, Durasein ®, Krion ®, LG HI-MACS ®, Wilsonart®, and Avonite ® may cost more upfront; however, this material is virtually future proof. Casework has traditionally been made of Plastic Laminate clad MDF with PVC glued to the edges. Some of the shortcomings of PLAM casework is the lifespan before adhesives start to fail, the durability of laminate materials and the lack of positive aesthetics. Once the casework is damaged or begins to come apart, it is no longer suitable for healthcare without the risk of harboring bacteria. No health system wants to find out that the loose PVC edging on a piece of casework is spreading bacteria. PLAM is traditionally made using square or rectangular shapes which limits the creativity of design. Today health systems are looking to assist people with ailments as well as being known as a leader in design. Solid surface material is ideal for the healthcare industry. Solid surfaces are non-porous making it resistant to bacteria growth. Solid surfaces are easy to clean and because there are no layers, it will not separate. Solid surface is easy to repair, long lasting and can be thermoformed into any shape. 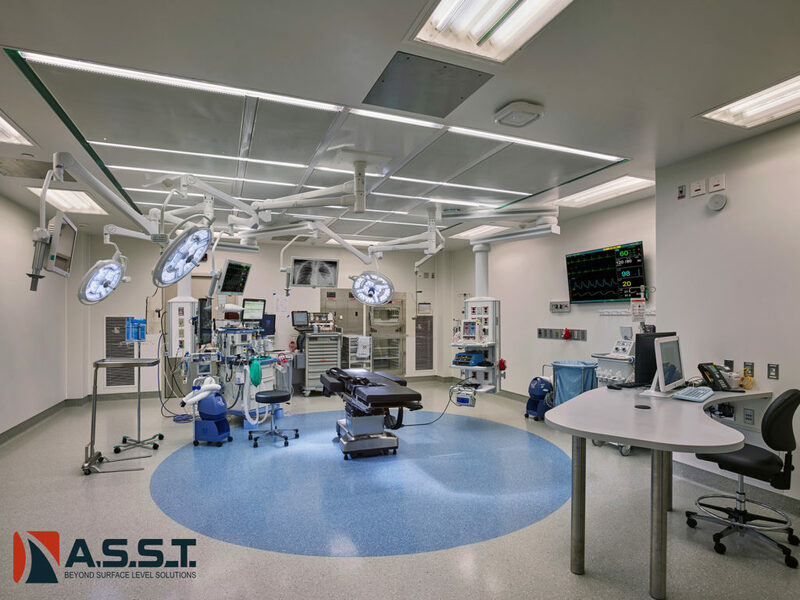 At ASST, we have 21 years of experience fabricating casework for the healthcare industry. 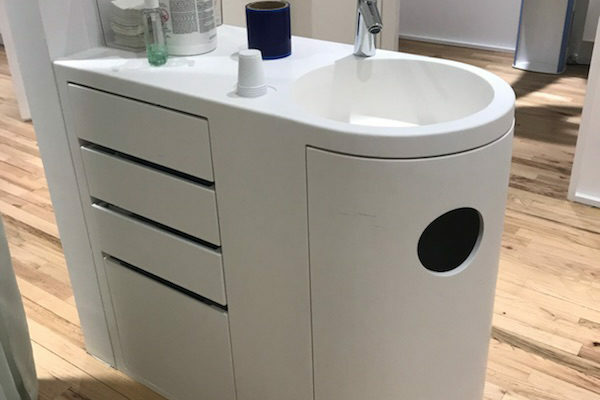 If you want to reduce the risk of spreading bacteria and wow your customers with the design, solid surface is the obvious choice. to the finest quality standards you expect. Contact us now online or call us at 717-630-1251.